The Cowboy is a single-layered collar best fitting small dogs about 10 to 25 lbs. It's 1" wide in the body that tapers down to 1/2" wide at the buckle area, allowing for lighter hardware and better fit on small necks. It's decorated with 3 stars and 2 gem stones, displayed in between sets of two vertical small studs. Choose from brass or silver hardware and 5 leather colors. 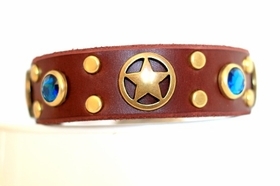 All of our collars are handmade using find quality materials in the U.S.A.